It’s not always easy to craft a tasty home-cooked keto meal. Perhaps the stress of day-to-day life has conflicted with your astute meal-planning habits. 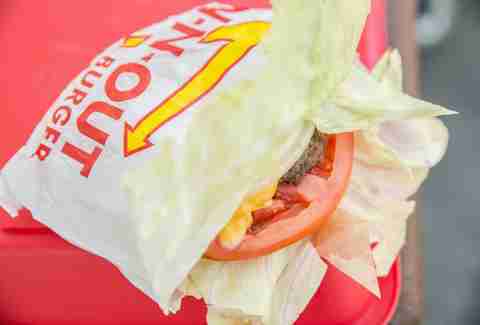 Or maybe you’re on a long road trip where fast food is not only customary but, quite frankly, one of few options. Or maybe -- just maybe -- you are completely over the same chicken breast and broccoli lunch you’ve prepared five times this week and are craving the efficiency (and grease) that only a fast food meal can truly supply. Luckily, many adaptable fast food menus provide keto-friendly options that are quick, easy, and low-carb. Oh, and delicious. For anyone unfamiliar, a ketogenic diet -- also known as the keto diet -- is a low-carb, high-fat diet that many rely on for weight loss and health purposes. By drastically reducing one’s carb intake, a keto diet shifts the body into what is known as a ketosis, a metabolic state where fat is burned for energy rather than typical carbohydrates. When done correctly, a keto diet can have surprising health benefits... all while upping your bacon intake. And what food group is more bacon-friendly than fast food? The two unexpectedly compatible in ways usually reserved for romantic comedies. To get the most bang for your ketogenic buck at the drive thru, hit these nine joints. Hold the bread. It’s easy to make a Chipotle bowl keto appropriate; just swap out your rice and beans for lettuce and get yourself a hearty and satisfying salad. You can even add a dollop of guac to get those healthy fats you need in a ketogenic diet and throw on some queso for extra richness. Forgo the corn salsa -- the tomato salsa is a better choice -- and you’ll be good to go. For all you west coast keto-dieters, In-N-Out's secret menu has keto options that are honestly just as good as their regular menu stuff. You can make any burger keto-friendly by ordering it “protein style,” thus swapping out the sponge dough buns for a crisp lettuce wrap. If veggies aren’t your thing, order off the secret menu item with the “flying Dutchman,” which is just two patties sandwiching two slices of gooey cheese. Whatever the craving, make sure you skip out on the Animal Sauce and stock up on napkins and you’ll be in the clear. Jersey Mike already has a name for their bunless subs: a sub in a tub (or a bowl, to be more accurate). Go for cold cuts, a philly cheesesteak, or a BLT. Abstain from their saucier proteins -- like their BBQ beef, chipotle chicken, and teriyaki -- which have a surprising carb count due their sugar content. Although KFC is renowned for the Colonel's crispy fried chicken, their batter unfortunately adds 8-11 net carbs for just one medium-sized piece. That being said, KFC can still be a keto-friendly spot to hit up when ordering Kentucky grilled chicken. 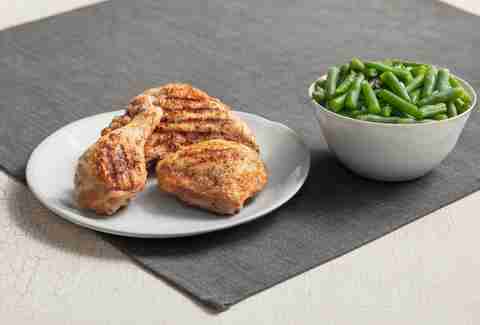 Add a side of green beans -- the only side that aligns with a keto diet -- and you've got a well-rounded, health-conscious meal that makes a solid case for casting keto-lover Joe Rogan as the next Colonel. OK, so Panda Express isn’t exactly the most low-carb-friendly option out there, but I had to include some options because Panda Express is delicious and I don’t want to prevent you from living your dreams. Instead of getting rice or chow mein, definitely choose steamed veggies as the base of your meal. Panda Express is also rolling out a new veggie-based dish chain-wide called Super Greens, which features kale, broccoli, and cabbage tossed in a wok with garlic. The most keto-friendly main courses include the teriyaki chicken sans sauce or the string bean chicken -- eaten in moderation because that sweet and savory ginger glaze also has sneaky carbs in it. 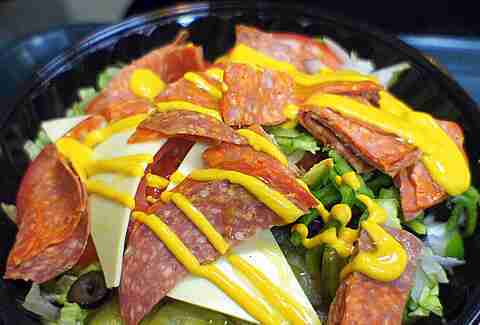 Eat fresh (and low-carb) at Subway by opting for a salad instead of a sub. You can even have most of your favorites -- cold cut, Italian BMT, club, tuna -- made into salads, which are tossed to order, ensuring everything is evenly dressed. Avoid the meatballs and sweet onion teriyaki, as well as overly sugary dressings, and you have a perfectly low-carb fast food option. Taco Bell loves you. You want a cheesy, beefy, fried calorific masterpiece? Taco Bell delivers. You want something a bit lighter, healthier? Taco Bell is down to bend over backwards and make all your low-carb dreams come true, thanks to their highly customizable menu. Opt for the power menu bowl and replace beans and rice with extra lettuce and guac for a protein-packed, fat-fueling dish. 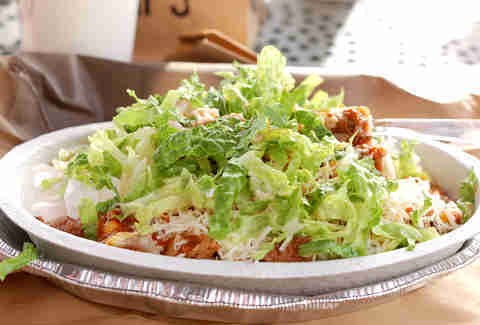 Or just build your own bowl with sides of protein, guac, sour cream, cheese, and lettuce. Their breakfast choices are also full of lean protein with eggs, bacon and sausage, and nacho cheese -- just skip the potatoes and tortillas. The combinations and possibilities are endless. Though a Sourdough Jack isn’t quite the same without the sourdough, burgers at Jack in the Box can easily be made keto-friendly once one discards the bun (or sourdough bread). Jack in the Box also boasts about their variety of buttery burgers, which thankfully can also easily be transformed into a keto appropriate meal -- once you nix the bun -- full of one of the best ingredients of all time: butter. If beef isn’t your thing, opt for the grilled chicken salad. If you’re into breakfast, order the country scrambler plate without homestyle potatoes. 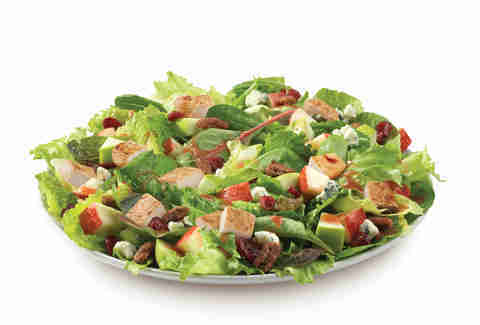 Wendy’s is awesome for keto diets because they already have delicious, low-carb salads available on their menu. Top that off with a Baconator, which is approximately half a pound of beef, cheese, and six slices on bacon -- sans bun and ketchup -- and you’ve got yourself a satisfying low-carb meal. If you’re not feeling their fresh beef, you can also get an order of their grilled chicken sandwich (without the bun, of course). 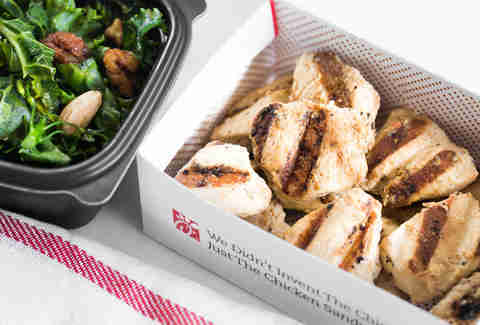 Chick-fil-A recently launched their new, keto-specific menu which makes ordering keto simple and efficient. Their keto-friendly menu offers items that all have less than 10 grams of net carbs, ensuring you stay on track while visiting the popular chicken chain. Some of the items are basic keto tweaks we already know and love -- like having the grilled chicken sandwich without the bun, or the sausage, egg, and cheese biscuit sans biscuit. Other options include their grilled chicken nuggets that pair beautifully with a side salad. The best part? Five of their dressings -- including the garlic and herb ranch as well as the avocado lime ranch -- are low-carb. Kat Thompson is a staff food writer at Thrillist. She wants to do the keto diet but could never give up rice. Find her on Twitter @katthompsonn.